Great replacement for Raydot Inlet! 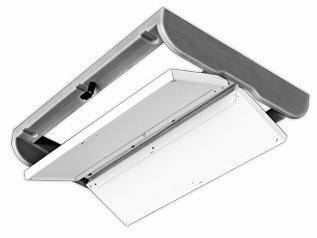 The RD1200 Two-Sided Ceiling Raydot Inlet is constructed with two frictionless Styrofoam lids on a continuous PVC hinge that swings down to access the main room to distribute clean attic air. The Bi-Flow Inlet has two lids for dual directional air distribution and are fully insulated to minimize condensation, dripping, or freezing. Long life PVC is flexible, noncorrosive, and non-binding hinge. Counterweighted inlet automatically closes when fan slows down. Available as an actuated inlet or counterweight inlet.